Dinky Toys of Liverpool, UK. Since 1923 Hornby Railway Accessories had been available as additions to the Hornby Train sets. However there was a demand for miniature railway personnel and passengers so in December, 1931, Meccano LTD started the production of the set Modelled Miniatures No. 1 - a set that was to be the forerunner of the Dinky brand. Two years later in December, 1933, Set No 22 was released containing the first road vehicles - 2 cars, a van, a tractor, a small truck and a tank. By April, 1934, the Modelled Miniatures range had been renamed "Dinky Toys" and had become very popular and collectible in its own right. The first Dinky Toys cars came on the market in December, 1933, but they were not called Dinky Toys until April, 1934. Originally they were part of the Modelled Miniatures sets and sold under the name of the originating manufacturers, Meccano, the Frank Hornby firm best known for its electric trains. The Modelled Miniatures were intended for use as accessories on model railroad platforms, and included figures of people and domestic animals, mailboxes, railroad signals, workmen's huts and even some non-motorized railroad rolling stock, in addition to the first of many motor vehicles. However, Tootsie Toys of America were introducing model vehicles into the UK at around this time and Meccano decided to widen its range of models to include vehicles, aircraft and ships. Production of Dinky Toys vehicles is said to have begun more or less simultaneously in Liverpool and Bobigny, France. British and French Dinky Toys were quite closely related throughout their history, occasionally sharing models, but more often (and particularly in the early days) producing different, though generically related, series of models. More and more Dinky Toys were produced by both branches through the late Thirties; then World War II brought production to a standstill for several years. By this time both branches had produced cars, trucks, buses, military vehicles, aircraft, ships and accessories of various kinds. Among the most popular models were the British 38 series of sport cars and 39 series of American cars. All six of the 39 cars came out before the war, but only three of the 38 series did. One model which in fact was never issued, was the 38 Triumph Dolomite - although having made it to the design phase, its place in the 38 series was taken by an Armstrong-Siddeley when the remaining three models were released after the war. In 1941 the Binns Road factory ceased operation as a toy factory and turned its efforts to essential munitions manufacturing using its diecasting equipment. However, before it closed, the directors of Meccano launched an appeal in October, 1940, to raise funds to purchase an RAF Spitfire aeroplane through the sale of a miniature Spitfire pendant that was sold for two shillings and sixpence. A total of £3250 was raised through the sale of over 26,000 pendants. Apparently remnants of prewar stocks were put on the market in time for the 1945 Christmas season, and certainly the December, 1945 Meccano Magazine announced the company would be releasing Meccano sets and Dinky Toys, but the first new Dinky Toy (a US Jeep) did not appear until 1946. Later that year production returned to normal and the last three 38 series sports cars joined the prewar trio. Numerous prewar models were now reissued, at first completely unchanged. One of the first notable changes occurred later in 1946. Both the UK and French branches had used plain cast wheel hubs and rubber tyres - now British Dinky Toys began to appear with more realistic cast hubs with a raised central section, while a shortage of rubber compelled the French factory to produce one-piece, all-metal wheels (including tyres) for a time. Since prewar dies and supplies had to be used for a while, there is no real clear cut, dividing line between prewar and postwar production, but a number of changes (beginning with the wheel varieties already mentioned) took place during the 1940s. The paint colours were often more drab when compared to the bright prewar colours, baseplates were now painted black in contrast to the unpainted, varnished prewar baseplates, steering wheels and the plastic windscreens were also altered. In 1947 an entirely new range of toys was introduced, - the Dinky Supertoys. Based largely on the Guy and Foden lorries, these models of large vehicles had their own type of diecast wheel hubs, with a partly concave pattern, and treaded rubber tyres. Until this point, all Dinky tyres had been smooth, but over the next few years a variety of treaded rubber tyres were produced for cars and commercial vehicles. Both Britain and France expanded production to include many interesting new models of various types, but they still used the original catalogue numbering system of one, two or three digits followed, in most cases, by a letter. When a series (for example the 28 series of delivery vans) ran out of letters, it was continued on a three-digit basis (in this case 280). The first Dinky Supertoys had been allocated 500-series numbers and all British Dinky Toys were changed to a three-digit numeral system in 1954, although some models were not actually renumbered until a year or two later. The Supertoys series was allocated a new range of numbers in the 900-999 range and the 500 series re-allocated to the French-made Dinky cars. By 1971 some models bore a four-digit number. French Dinky Toys changed to a similar all-numeral system during 1959 and the 500 and 800 numbers were reserved for the French models but any French model introduced early in 1959 had an old number allocated before the new system was introduced. In the British system, one and two digit numbers were used for accessories, 100 to 199 for cars, 200 to 249 for racing and (later) sports cars, 250 to 299 for emergency and public service vehicles (buses, fire engines, police cars, ambulances, road rollers, refuse trucks, etc. ), 300 series for farm equipment (and much later for character cars), 400 series for commercial vehicles, 600 series for military vehicles, 700 to 749 for aircraft, 750 to 799 for non-wheeled vehicles and accessories, and 900 numbers for Supertoys, including a few large aircraft. The French Dinky 500 numbers were used for car and small trucks, with military vehicles, aircraft, Supertoys and accessories in the 800 series. This era saw many changes in Dinky Toys. Possibly in an effort to compete with the newly released Corgi brand, bright two-tone colour schemes for cars were introduced in 1956. Few previous issues had been painted in two colours although the last American issues of the 38 series were an exception. Corgi Toys came equipped from the start with clear plastic windows which didn't appear in Dinky Toys until 1958 (in the #176 Austin A105 Saloon). 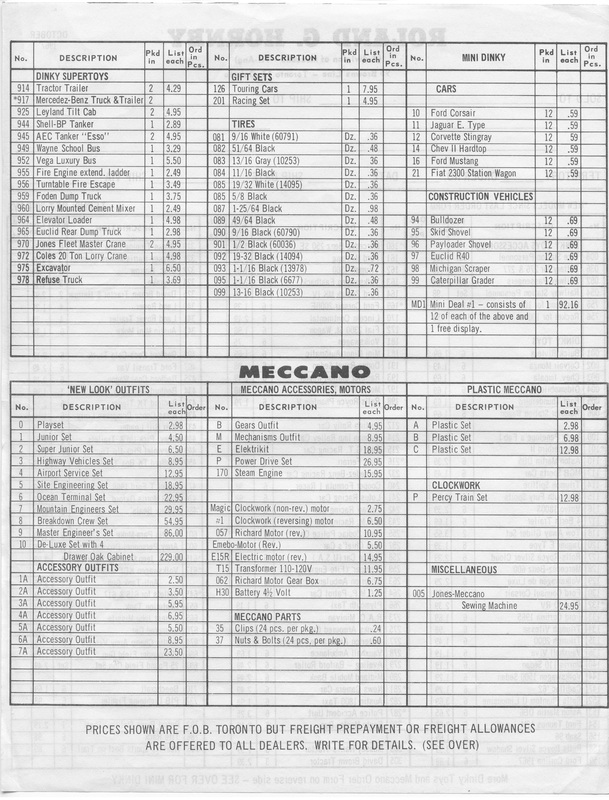 The Dinky Toys Club (a natural development of previous initiatives for collectors) was inaugurated in 1957 and advertised widely in the Meccano Magazine. Also in 1957 the first Dublo Dinky Toys appeared, intended (as the "Dublo" name implies) for use on OO gauge railroad platforms. Though a few small-scale models had been produced since the Thirties, most Dinky Toys had been built more or less to O gauge: 1/43 to 1/48 scale, with larger vehicles generally made to a slightly smaller scale so as not to look excessively big beside models of smaller vehicles. The Dublo series never really caught on and was withdrawn after a few years, leaving the OO gauge market to Matchbox, Budgie and others firms, while Dinky and Corgi competed for dominance in the O gauge area. Suspension was introduced in 1959, fingertip steering in 1960, and wealth of moving and detailed parts in the Sixties. In 1963 the British branch of Dinky Toys was bought by the Tri-Ang firm, and in the same year the first Dinky vintage car, a Model T Ford, was issued. Dinky Toys’ horizons were expanding in numerous ways, for in 1965 six models of American cars were made for Dinky in Hong Kong. Another Hong Kong range, the small-scale Mini-Dinky Toys, appeared in 1968 *, with each model sold in its own plastic garage. Most of the castings were completely of Hong Kong origin, though six pieces of heavy equipment originated with Mercury of Italy, were later produced by the unrelated US-Canadian firm of Mercury Industries, then by Gibbs of Ohio, and subsequently by Universal of Hong Kong. Two racing cars in the series were made by Best Box (sometimes written "Bestbox") of The Netherlands. 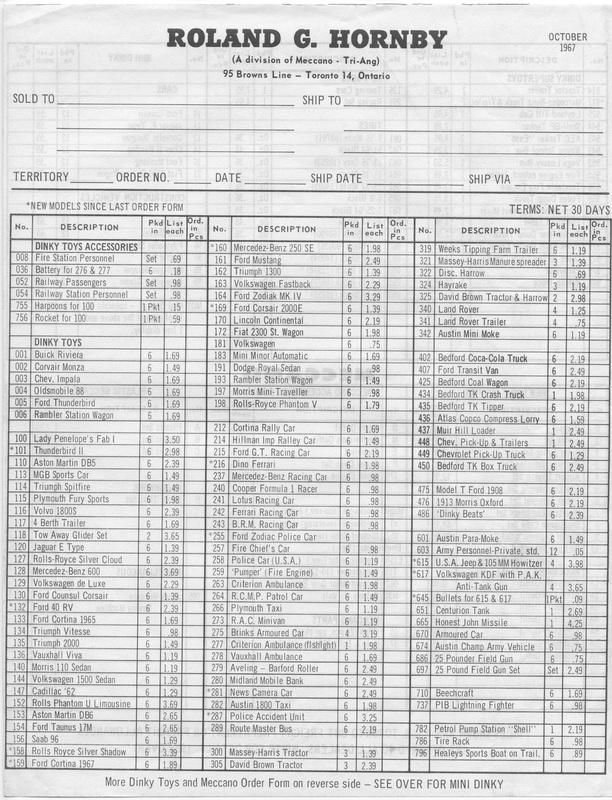 * Peter Zimmerman advises he has in his possession a 1967 Canadian price list that lists 6 Mini Dinky automobiles and the full range of 6 Mini Dinky construction vehicles, so this date would appear to be at least a year out. Peter has provided images of the Price List for use on this site and I have included them below — they link to larger images. He has also written an excellent article on the Mini-Dinky construction vehicles that can be viewed HERE. These images are copyright Peter Zimmerman and you MUST contact him if you wish to use them. Late in 1967 the diecast toy market was strongly influenced by the first Mattel Hot Wheels, making it necessary for numerous others firms, including Dinky Toys, to develop similar wheels. Dinky Speedwheels first appeared in 1969, and this change was paralleled by others that brought more realism, more gimmicks, more play value, and more character cars based on children‘s television shows and mainstream films. Speedwheels, usually with chromed hub patterns, appeared on a variety of vehicles, replacing to some extent the many realistic cast hubs that had begun to appear a few years before, and models of real cars and trucks were joined in growing numbers not only by motor vehicles for Lady Penelope, Parsley, Candy, Andy and the Bearandas and the like, but by a number of space characters and vehicles as well, most notably those of the popular Star Trek program. This trend, which had begun with Santa Claus and the Dinky Beats, kept growing, to the dismay of those who prefer scale models of real road vehicles. Sadly all these model changes were not enough to keep Dinky Toys solvent. French production ceased in 1972, though the Spanish firm of Pilen manufactured some French Dinky Toys later in the Seventies and Solido made an effort to do the same in 1981. The British branch struggled on until 1980, farming out some production to Polistil in Italy as well as the Universal company in Hong Kong. Since the 1980s the name of Dinky Toys has changed hands at least two more times, and occasionally Hong Kong Products appeared with the Dinky Toys name on their packaging. In 1987 the Kenner-Parker firm, whose branches include Tonka Toys, sold the Dinky Toys name to Universal International of Hong Kong, already the owner of another time-honoured and originally British trade name: Matchbox. Soon afterward, Kenner-Parker took over Polistil and acquired some of the last old Dinky Toys dies. Other dies had previously been sold to a firm in India, which marketed them as Nicky Toys - a cruder version of the Dinky that has become highly sought after by Dinky Collectors. Late in 1987 Universal International brought the Dinky Toys name back to life by applying it to new colour variations of six Matchbox cars. The firm subsequently announced that the name would be used for a new series of Cars of the Fifties. This led to the creation of the Modern Dinky Toy range, issued through the Matchbox Collectibles franchise. The range expanded quickly to include several exciting new models and this trend continued under the stewardship of Matchbox Collectibles, but the brand has sadly been overlooked by the new owners of both the Matchbox and Dinky brands, Mattel, in favour of their existing brand, Hot Wheels.